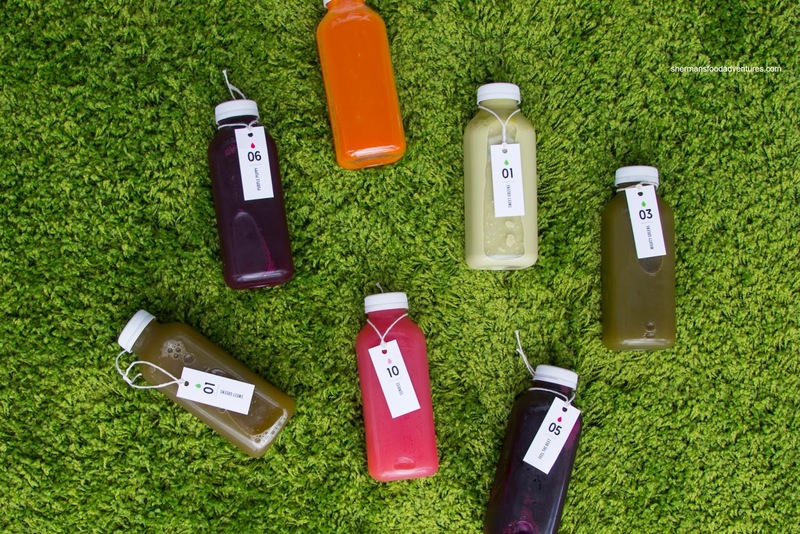 The chances of finding me hanging out at a juice and/or health bar are directly correlated to media invites. Yes, I'm not much of the health nut and I went into this invite like many others of the same genre - with trepidation. It's not like I don't like juice though, I just don't seek it. 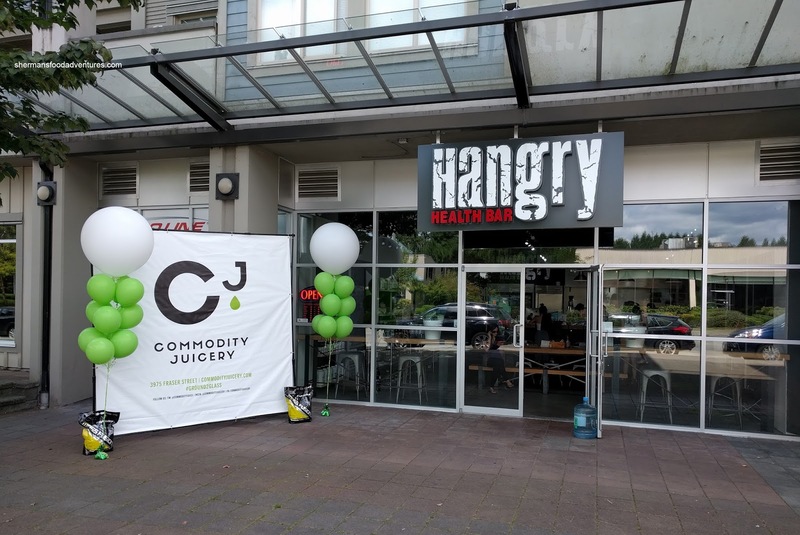 The interesting thing about Hangry Health Bar is that not only do they serve up some nutritious eats, Commodity Juicery sets up shop there as well. We got a wide range of items to try including juices, smoothies, rice bowls and smoothie bowls. Packed with pineapple, mango, cantaloupe, banana, turmeric, ginger, dates, coconut, & apple juice, the Coco Loco smoothie bowl was loaded with flavour. 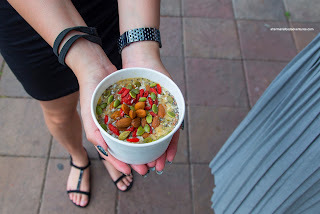 If you can imagine, the combination of fruit added natural sweetness and the topping of goji berries, sunflower seeds, coconut flakes and chia seeds and almonds provided both textures and several more layers of tastes. As much as I'm not into the health food thing, I enjoyed eating this and went back for more helpings. We then moved onto sampling Commodity juices with the Sunrise, Sweet Greens, Mighty Greens, Orange Roots, Feel the Beet, Matcha Milk and Purple Puppy. For me, my favourites were the lighter juices including the Sunrise sporting the sweetness and tang of grapefruit with a hint of mint. I also enjoyed the Orange Roots where the layers of flavour from the apple, carrot, lemon and turmeric was sweet and aromatic. The one odd duck from this selection was the Matcha Milk which was creamy and milky with cashews, almond and maple syrup. 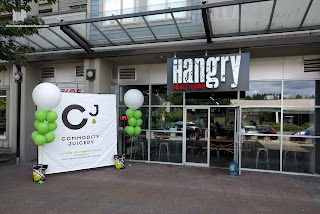 The other major item on the menu were the Hangry Bowls including the Marley, El Loco, Bangkok, Wild West and Hawaiian. I thought the Bangkok with tofu was the most impactful as the spicy peanut added lots of crunch and lingering heat. There was also a balancing sweetness. Also rather spicy was the Marley with chicken. The jerk sauce had oomph while the crunch from the cucumbers added texture and brightness. I guess spicy was the theme as the El Loco with chicken featured a creamy and spicy chipotle sauce. The freshness of the salsa lightened things up. 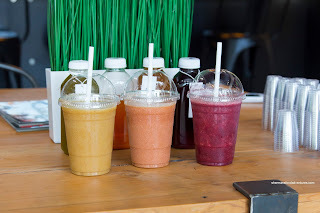 We ended off with some Signature Smoothies in the Tropical Storm, Strawburst and Very Berry. Consisting of pineapple, mango, cantaloupe and banana, there were layers of fruit in addition to the aromatic coconut in the Tropical Storm. I thought the Strawburst was similar to many strawberry banana smoothies I've had, but with a twist of cinnamon (just enough though). Again, the Very Berry seemed like a typical offering, yet it was spiked with lemon and ginger which added a touch of bite. These were some refreshing treats to end off the tasting which was a whole lot better than I was expecting. 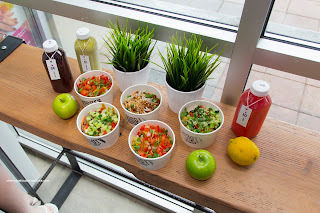 As much as these were fairly healthy bevvies and rice bowls, there was no absence of impactful flavours.